A little bit of background first, I’m a college student who stopped cutting my 4c? hair around 4 years ago. I say “stopped cutting” instead of “started growing out” because I had literally no idea what I was doing. 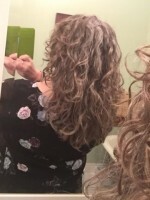 I had no knowledge of how to take care of natural hair and essentially destroyed it over the years based on a few misconceptions (I combed it out every morning with just water and no other products, so it was always dry, wispy, and broken). I’ve figured out in the past few months what I should be doing in a general sense, but I’m still basically waving my hands around in the dark. I’ve tried two strand twists to try and restore my curl definition, but I’m just not sure if the results are what they should be. My hair doesn’t cooperate or react in the ways I see others do on YouTube, and I’m plagued by frizz and flyaways. Is my hair damaged enough that I should big chop and start over? Or am I overreacting and I can salvage this with careful routine? Welcome to CurlTalk! I don't know anything about 4C hair, but hair is hair - so this is just general knowledge stuff. If you haven't done any chemical treatments (straightening, dying, etc. ), then you can improve the health of your hair with careful treatment. No need to big chop! Although you might want a little trimmed off - just enough to clean up the ends. Split ends are bad, so make sure you get those cut off if you have any. Your hair is probably dry and needs more moisture. Deep conditioning treatments can help. Conditioner every day, even if you don't wash. I've heard good things about the LOC method - try looking that up. I agree with @Guide 65 that your hair should not be damaged so much that it requires a "big chop." Damage that bad generally comes from frequent use of high-heat styling (blow dryers, flat irons). I agree that your hair looks dry and could use more moisture. Have you read about the Curly Girl method (sometimes guys call it the Curly Guy method)? You could check the book out of the library (Curly Girl by Lorraine Massey). Another good book with a lot of information is Curl Revolution. The Curly Girl method recommends avoiding silicones and sulfates in hair products: the silicones coat the hair so that moisture can't get in, and to get the silicones off, sulfate shampoos are necessary, which are harsh and dry out the hair. 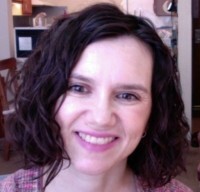 I would recommend trying the Curly Girl method and seeing if that improves your hair. In the meantime, you could try doing a deep conditioning treatment with your regular rinse-out conditioner. Wash your hair as usual and then squeeze out the excess water. Work your conditioner into your hair and then cover with a plastic cap, and a towel on top of that (to hold in body heat). Let sit for 15-30 minutes. Then rinse out and style as usual.